9My work with Pam on TTouch for Fozzie has tipped me off on some equipment that can really make a difference for working with dogs like him. For the groundwork part of our session the other day, Pam got out a nifty little leash with attachment hardware on both ends, and attached one end to his harness and the other to his head halter. You can make one yourself by getting a carabiner from the hardware store for a few bucks and putting it on the handle end of your regular nylon leash. The single leash attached in two places makes handling Fozzie so much easier. 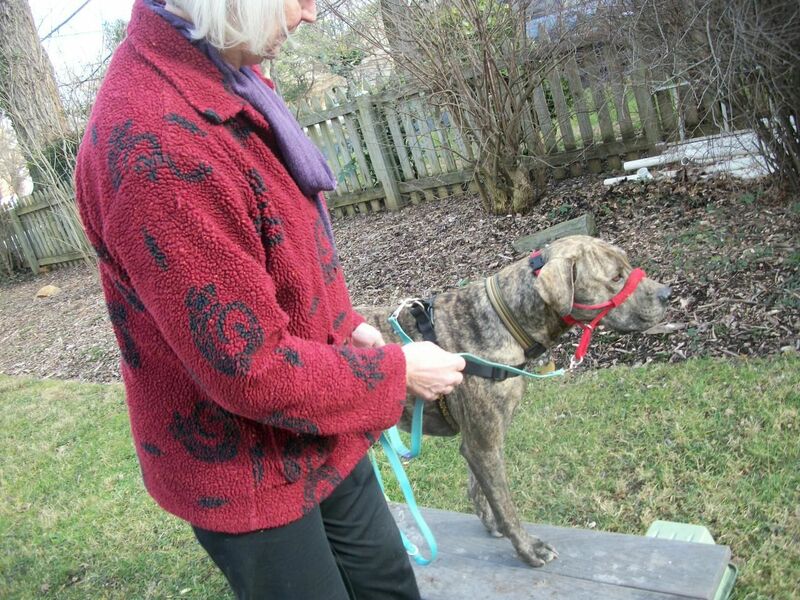 Pam also recommended not using the Easy-Walk harness we have always used. She showed me how the Easy Walk restricts movement with the band that goes right across the shoulder where it moves, and indeed, Fozzie has always shied away from me when I hold it up to put it on him. We have started using a step-in harness that Fozzie inherited from his cousin Genghis. I try to make putting on the harness fun by luring him forward to step in it himself. For a dog who is so gregarious and tough-looking, Fozzie is surprisingly hesitant and shy about certain things. He cowers and runs behind the rocking chair or the rose bush when I hold up his harness. I am certain that it has to do with my own impatience...or maybe the Easy Walk was really uncomfortable for him. In any case, we are really enjoying the game of putting the step-in harness on the ground, enticing Fozzie to step those gorgeous little white-tipped wonders forward, and then celebrating with a cheer and a cheesy snack when they go right where they're supposed to and I can snap that harness in place. So precious. It makes me feel like I'm dressing my kid up for school. I also like the step-in because it provides a nice handle on top, so you can lift your dog like a six-pack. It is certainly not ideal having to manage walks so tightly with all this equipment, but I do believe that with enough practice with the right equipment, which prevents practicing the behaviors we don't want, the good behaviors will become second nature. Fozzie and I are boldly going forward toward that day. We enjoy reading about Fozzie's learning experiences. We were considering purchasing the Easy-Walk Harnesses this weekend for our Rat Terriers - Phoebe and Lily. Please tell me more about what you did not like about the harness. Also, tell more more about the red head harness you are using. Phoebe and Lily are still learning to walk with a lead and are constantly pulling - even with a prong collar. The prong collar bothers me because I worry about hurting their necks. Those are good questions! I actually have liked the Easy Walk Harness, more or less. I do think it helps a lot on walks with dogs who are strong pullers --it really seems to inhibit the pulling. And many trainers will tell you that that is just managing the pulling, rather than re-training the behavior, but I disagree. If a dog isn't able to practice a behavior like pulling, he is getting into the habit of doing something better--not pulling! We've used the Easy Walk for about 2 years now and by this time Fozzie really doesn't pull much at all. The head halter we use is the Snoot Loop. I have mixed feelings about it...I think if used the way some trainers recommend it, by yanking the dog's head, it can do real damage to the neck. 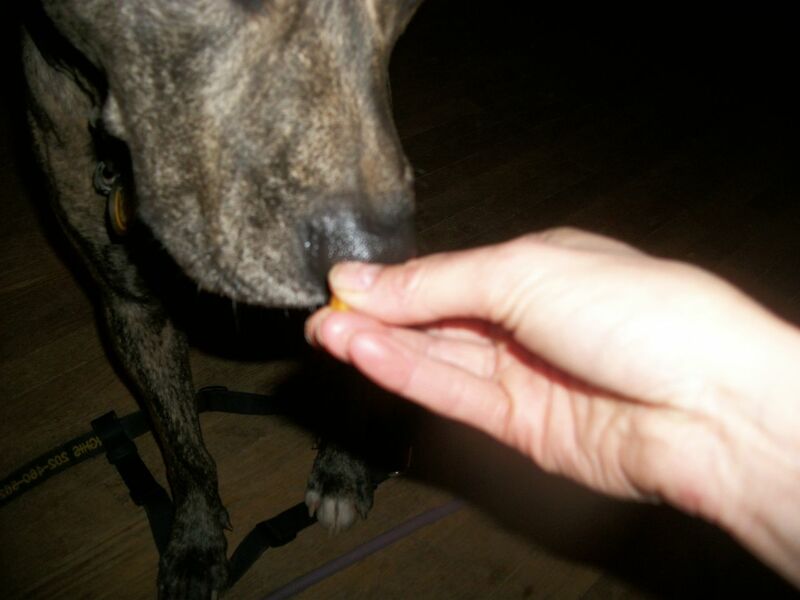 On the other hand, TTouch practitioners recommend it because you can gently control the dog's head, and because the pressure on top of his nose actually releases endorphins. You can see more about my experiences with it here http://peacefuldog.blogspot.com/search/label/equipment. I'd love to hear about your own experiences!